While I was Christmas shopping in Colchester this afternoon, I took a bit of time out to go to the Colchester Art Society’s Winter show. It is at The Minories Gallery, 74 High Street Colchester CO1 1UE. All three of the ground floor rooms are filled, and there is some interesting work here. 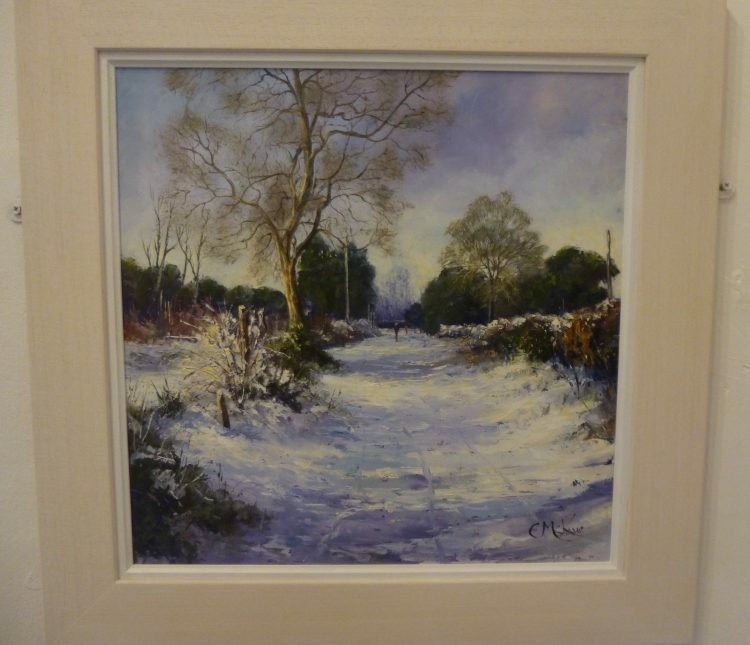 The stand out painting for me – by a long way – was Carol McKue’s oil, ‘Winter Walk’. The winter trees are beautifully captured, and I love the violet tones of the shadows on the snow echoed in the clouds and the distant trees. It has a lovely depth to it, and a real feel of crisp frosty cold. The show runs until Thursday, 21st December and is open from 10.00am – 5.00pm daily except for Sundays. The Minories shop is also open with lots of cards, and small gift ideas – including some very nice pottery and little turned wood trees which were very appealing. So if you’re local to the area and still stuck for Christmas presents it would be well worth a visit. The snow has gone. Now we just have rain . . . . Twelve more days till Christmas!